I am not a huge fan of baking, mainly because you have to be so exact for good results. There are about three or four cookies recipes that I can make without causing a major disaster in the kitchen—this is one of them. This is Isa Chandra Moskowitz’s recipe, found on the Post Punk Kitchen (PPK) website. 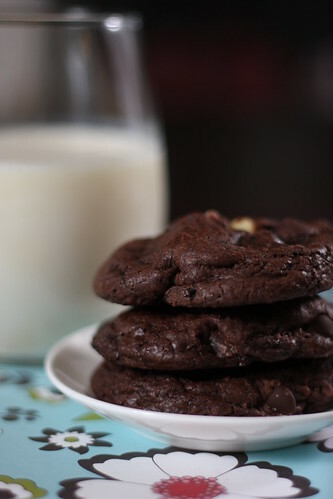 This is one double-chocolately, chewy and cakey cookie. I think the addition of macadamia nuts is great, but they are not necessary for the recipe. The use of ground flax seeds dissolved in soy milk functions as the “egg,” binding the ingredients together. And the secret added benefit of vegan cookies is—you can eat the batter without worrying about salmonella poisoning … neato! I have never wanted cookies more than I do now. ok these look amazing! I am always perplexed at baked goods without any eggs though, I don't understand how that works? I should make it and see! When you blend the flax seed with the soymilk, it becomes very goopy, just like an egg and acts as the binding agent. No salmonella risk here, so you can eat the batter while preparing!